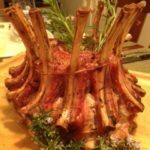 Loin roast has a single muscle, and great for slicing. This is what pork used to taste like. Tender, flavorful and beautiful color. No juices added. Our Berkshire pork has its own natural juices. 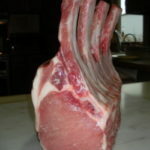 Bone-in loin rib roast has frenched tips and the rack of loin roast does not have frenched ribs. The photo only shows the frenched tips. Both bone in roasts have a nice fat cap. Prairie Pride Farm of Minnesota © 2019. All Rights Reserved.